If you are looking for the next big trade, it’s important to pay close attention to the silver price. The mainstream media may have you convinced that silver isn’t worth a look. Don’t get too distracted by this noise, though. The silver price forecast for 2019 looks extremely bullish. Silver investors could be in for a surprise this year. This silver price prediction for 2019 may be considered bold, but the gray precious metal could be making a solid run toward the $50.00-an-ounce mark. This bullish silver price forecast for 2019 isn’t based on gut feelings. There’s a lot of data that supports this argument. There are at least five things worth looking at when trying to predict where silver prices could go in 2019. While your evening news may be talking about Bitcoin and other cryptocurrencies or marijuana stocks, there currently is a rush going on and no one seems to be talking about it; investors are rushing to buy silver. To catch a glimpse of it, look at mint sales around the world. Putting it in other words, silver demand at the U.S. Mint has surged close to 50% year-over-year! Beyond mint sales, pay attention to India as well. The country known for its gold appetite is buying a lot of silver. In 2018, we saw significant growth—triple-digit growth—in silver imports into the country. We still see strong silver import numbers from India. If investors continue to buy, this could be one catalyst that sends the silver price soaring in 2019. Don’t forget, silver isn’t just a precious metal. A lot of silver is used for industrial purposes. In fact, over 50% of all silver mined is used for industrial purposes. The metal is used as a key ingredient in many industries. Now, let’s do some math. If we assume that each smartphone sold in 2018 used just 0.3 grams of silver, then all together, almost 16.5 million ounces of silver were used. Here’s what must be noted: smartphone sales are expected to increase globally for the next little while. So it’s not irrational to assume that more gray metal could be needed to make more smartphones. As I said earlier, silver is used in many industries. In some industries, it is very critical. For example, with the current technology in place, you can’t have solar energy without silver. Solar demand is booming as well. Saying the very least, if the industrial demand for silver remains strong, then silver could be worth holding in 2019. The supply side of the silver market is very critical to watch as well. If silver prices remain at their current levels, there could be a possible shortage in the silver market and it could send silver prices soaring. Will it happen in 2019? That may not be the case, but we could see even more evidence of a coming shortage. After the sell-off in silver prices back in 2013, silver mining companies started to reach for high grades. They needed to lower their costs and were successful in doing so. But now their costs are rising. Many silver mining companies are reporting massive increases in their cost of production. Also, as they were reaching for high-grade ground, they pulled back on exploration spending. Don’t forget, exploration spending is an investment in future production. In mining, resources deplete, so mining companies must continue to spend on exploration or their survival becomes questionable. This phenomenon is worth watching further. If silver prices remain at the current level, we could see mining companies suffer more and production could be on the line. If you look at major silver-producing regions like Mexico, we are already seeing mine production starting to look anemic. If the supply side issues persist and demand remains strong, basic economics suggests that silver prices could jump higher. Beyond the basic supply and demand in the silver market, understand that key valuation ratios for silver prices suggest the metal is severely undervalued and could be worth the investment. One ratio is the gold-to-silver ratio. Before going into any details, please look at the chart below. What is the gold-to-silver ratio? At its core, this ratio tells us how many ounces of silver it takes to buy one ounce of gold. Currently, 85 ounces of silver are needed to buy one ounce of gold. In the chart above, something interesting has been happening over the last 25 years. You see, whenever the ratio goes above 80, it then makes a move toward 40. The last time we saw this happen was in 2011. If we assume that the gold-to-silver ratio drops to 40 again in 2019, then what’s next for silver prices? If we keep the gold price the same (around $1,280), then the silver price would need to rise to around $32.00 an ounce. That is roughly 113% above the current price. 5. Could There Be an Upcoming Crisis? Lastly, think on a big-picture level. Could there be a financial crisis in 2019? Digging a little deeper, 75.7% (or about $157.0 trillion) of the derivatives are based on interest rates. As it stands, interest rates are very uncertain. At first, the Federal Reserve said it wanted to raise rates no matter what. Recently, the Fed has had a change of heart. It now says it will be patient, but rate hikes are still on the table sometime down the road. All of this is causing investors to question what’s next. Here’s the thing; we are seeing a lot of indecisiveness from other central banks as well. For instance, the Bank of Canada is saying that it’s not sure what is ahead, the Bank of England is waiting to see what happens with the Brexit fiasco, the European Central Bank (ECB) is questioning if more needs to be done to boost the common-currency regions, and so on and so forth. With this, one has to question if the derivative market could see some trouble. $207.0 trillion is a massive amount. In nominal terms, U.S. gross domestic product (GDP) is around $19.39 trillion. These derivatives have a notional value of almost 10.7 times the U.S. economy! Banks are severely leveraged. Just 25 banks in the U.S. have $18.80 worth of derivatives for every $1.00 of assets. The derivative amount globally is much higher. This could send waves of uncertainty around the global economy. The global financial system is very connected. Where do you think investors will run to? In times of uncertainty, precious metals provide a strong refuge. We could see them coming to the silver market, and this could send silver prices surging in no time. If you look at silver prices from a technical analysis perspective, the precious metal could be headed much higher. Remember the most basic rule of technical analysis: the trend is your friend until it’s broken. 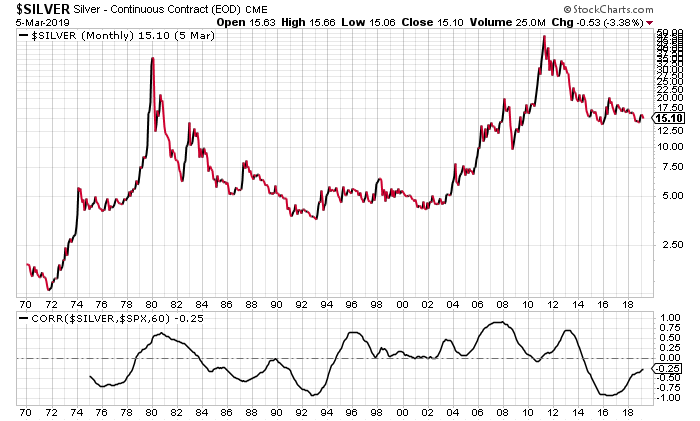 The long-term trend for silver prices remains intact. So, with this, it’s not irrational to believe the precious metal price could continue to move higher. Look at the chart below. There’s one more chart that investors need to pay attention to. Look at it below. At the top of the chart, we have plotted silver prices over the last 50 years. At the bottom, we have plotted the correlation between the silver price and the S&P 500. Whenever the correlation between silver prices and the S&P 500 becomes extremely negative, we see a bottom in the precious metal price. For instance, look at 1976 and 1992. After both of these instances, a major rally in silver prices followed and continued for several years. In 2016, this correlation hit extremely low again. We are asking if the bottom in silver prices is in place and if the precious metal is setting up to soar. How High Could Silver Go in 2019? In 2019, as we see it, it may be foolish to have a bearish take on the silver price. As I said earlier, the gray precious metal could reward investors immensely. Here’s the thing; if silver starts to see a rapid escalation in price, then it would mean that speculators are coming in and the price may not be sustainable for the long term. We want to see a gradual increase. Unless there’s an outright economic collapse, a rapid increase is undesirable. In 2019, there are a few levels we are keeping a close eye on. The first level worth keeping an eye on to the upside is $21.00. If the price is able to close above it, we could see buyers rush to buy more. This is the level where sellers came in back in 2016. Silver breaking above $21.00 would mean the resistance level is broken. Remember, when resistance breaks, it becomes a level of support. Silver breaking above resistance could really cause fireworks in the silver market. The next level of resistance for the precious metal isn’t until $25.00. If silver prices break above $25.00, the next level isn’t until $35.00. You see, if an investor buys silver bullion, they will earn solid returns if silver prices hit $50.00 in the next few years. Doing simple math, if they buy an ounce of silver for $15.00 and it goes to $50.00 an ounce, their profits will be around 233%. Mind you, while the prices get there, investors will be on the hook for storage costs. Dear reader, 233% is a respectable gain, but investors could make the gains on silver much sweeter. They could look at silver mining stocks. Consider that if a silver miner produces an ounce of silver for $10.00 an ounce, with silver prices currently at around $15.00 an ounce, their profit margin is around $5.00 an ounce. Now, if they continue to produce at a similar cost, with a silver price of $50.00 an ounce, their profit margin shoots to $40.00 an ounce. This represents an increase of 700% from just $5.00 an ounce. Obviously, their stock price would reflect this.